It’s simple! In one of our Scentsy Candle Warmers – which are electric and plugin to the wall directly (nightlight version) or plugged in using a lamp like cord with an on/off switch. Most of our warmers use a light bulb to warm the wax, however, we also have the element warmers that use a heat plate instead of a bulb. These Element Warmers are great for the bedroom, since they don’t give off any light. 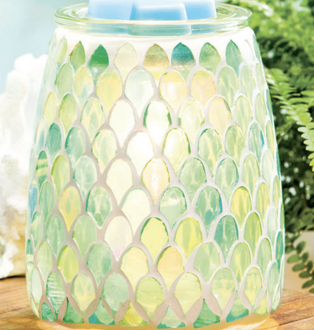 So, go ahead.. pick a warmer of your choice and then you’re off to pick your scents– and we have lots of them. There’s over 80 unique fragrances to choose from. That’s it, that’s all you need. The day your Scentsy candle warmer arrives: Tear open the box, hug your UPS man.. and get ready for a unique fragrance experience. All kidding aside, don’t rip the box, just yet. Remove the warmer carefully from the box, place it where you’d like it, preferably away from windows and doors where the scent will escape to. If you received a warmer that uses a light bulb, you would remove the bulb from the packaging and screw it in the warmer base, if there’s no bulb, skip that step. Plug the warmer into the wall and flip the switch to turn it on. 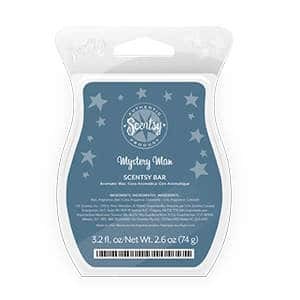 Take one of those Scentsy bars you picked out and bend the container a little to break two cubes from the rest of the bar. Place the two cubes in the top dish of your candle warmer. Sit back and within about 10 minutes, you’ll start smelling one of our 80+ amazing scents. Keep in mind that the wax will never dissipate, you will stop smelling the scent after a few days.. probably about 4-5 depending on room size. When you stop smelling your Scentsy wax scent, simply soak up the wax using a paper towel, tissue paper or my favorite, 2 cotton balls (they work the best) Now, you can put another two cubes in of the same scent, or try one of your other scent picks. Have fun.. try new scents! Be brave.. sometimes we fall into habits of picking the same type of scents over and over, but when we do this, we become accustomed to scent notes and we don’t smell them as strong anymore. My advice if you love clean scents.. mix it up for a bit with something with spice , like cinnamon.. then you can go back to clean scents. 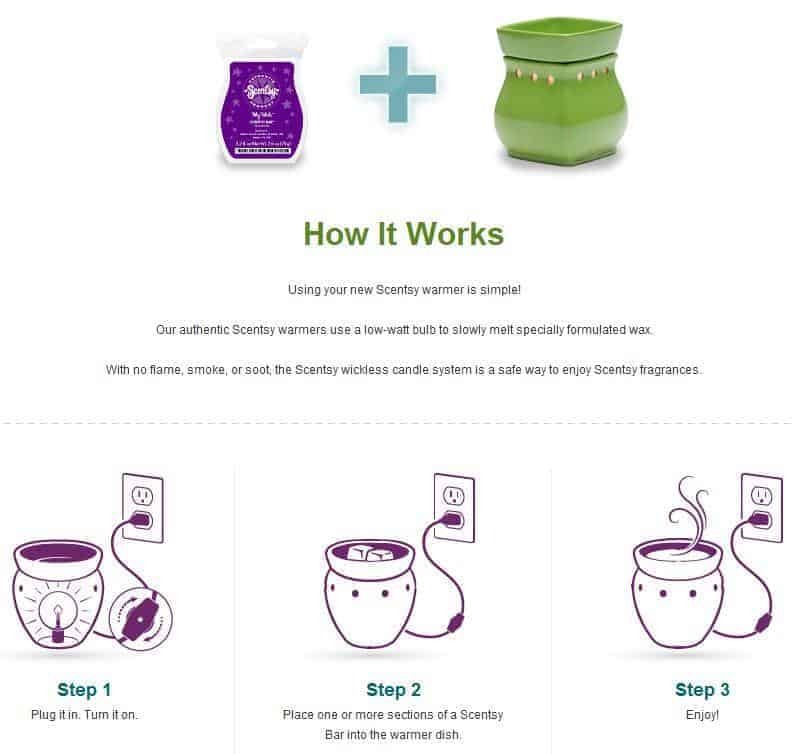 I hope this description of how Scentsy works is helpful and you have a better understanding of our product. 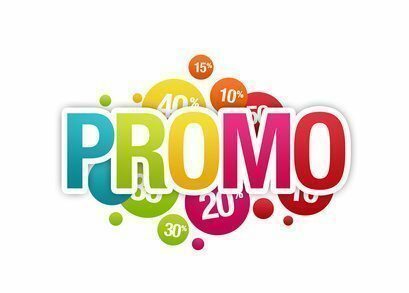 Make sure to also checkout our other products we offer like our Diffusers, Oils, Scents on the go such as Car Fresheners, Travel Tins, Room Sprays and even our kids line of products!